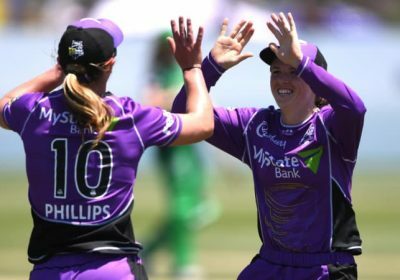 The Hurricanes racked up 6-196 – their highest WBBL score – before they limited the Stars to 124 off 16.5 overs, as the hosts bounced back in style from Saturday's five-wicket defeat against the same opponents. Smriti Mandhana made the most of the short boundaries at West Park on the banks of Bass Strait, the opener top-scoring with a sparkling 69 off 41 balls including 13 fours. The only bad news was a possible recurrence to a hamstring injury to star import Hayley Matthews, with the Barbadian run out after she slipped while attempting to regain her ground at the non-striker's end. By that time the recognised batters had all departed, including match winners from Erin Osborne (16) and Mignon du Preez (3). In Ballarat, the Melbourne Renegades and Adelaide Strikers had to settle for a share of the spoils, with their WBBL match falling victim to persistent rain. Sunday afternoon’s match was just three balls shy of being a result, determined by the Duckworth-Lewis method, with the Strikers 2-27 off 4.3 overs when rain again swept through. The Renegades had faced 14.3 overs reaching 4-83 when rain first hit Eastern Oval, forcing an early finish to the home side’s innings. Sophie Molineux top-scored for the Renegades with 44 not out off 37 balls before their innings was cut short. That left the Strikers chasing 78 for victory off 11 overs, losing key batters Sophie Devine and Tahlia McGrath in the search for quick runs. The Melburnians were seeking to make it a clean sweep over the Strikers, having won a dramatic contest on Saturday as Claire Koski hit a four off the last ball of the match.